Did you know that as a Box Hill Staff member or student you can access high-quality discounted Veterinary Services and dog grooming? Pets on Elgar is Box Hill Institute-run clinic and training workplace for veterinary nursing and pet grooming students. Students work under the direction of experienced veterinarians and supervision of veterinary nurses & pet groomers to look after your animal buddies. 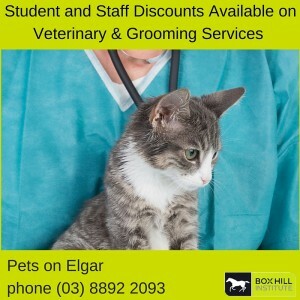 Current staff & students of Box Hill Institute receive 20% discount on top of the already discounted prices on veterinary services (excluding pet food, veterinary drugs, grooming products and merchandise). This can mean saving hundreds of dollars on some services like desexing. Appointments essential: please call (03) 8892 2093.